Mature Height 10 - 15 ft. Mature Width 10 - 15 ft. There is always a need for a tough plant for those tough spots that are found in most gardens. Underneath large, established trees; in a hot, dry area; where you need evergreen screening in a hurry; or where you want an easy, low-maintenance plant in a harsh urban situation. California Privet is the answer to all these problems, and more. This tree, with its smooth, glossy evergreen leaves and scented white flowers, is one of the toughest and fastest-growing small trees around. It will grow at least 3 feet a year and soon reach its maximum height of around 15 feet – ideal for screening the lower windows of an apartment building or reducing noise and dust from a busy road. It can be allowed to grow naturally, or it can be trimmed whenever and however you choose, to keep it even denser and control the height. 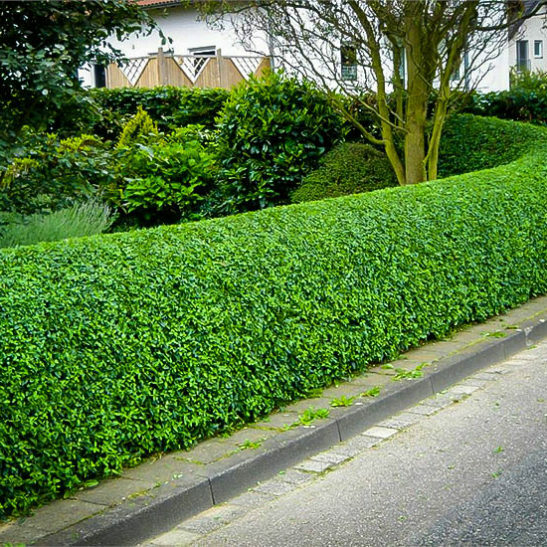 With regular trimming it soon becomes an attractive evergreen hedge worthy of a place in any garden. 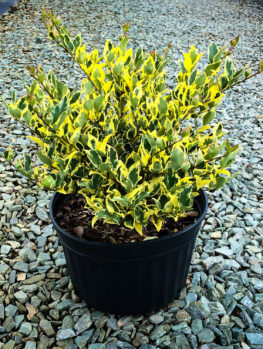 Plant the California Privet in almost any location – it will thrive in spots other trees just cannot cope with. It will grow in any kind of soil except ones that are constantly wet, and in any light, from full sun to the shade underneath large trees. It has no pests or diseases and once established it is very resistant even to harsh drought conditions. 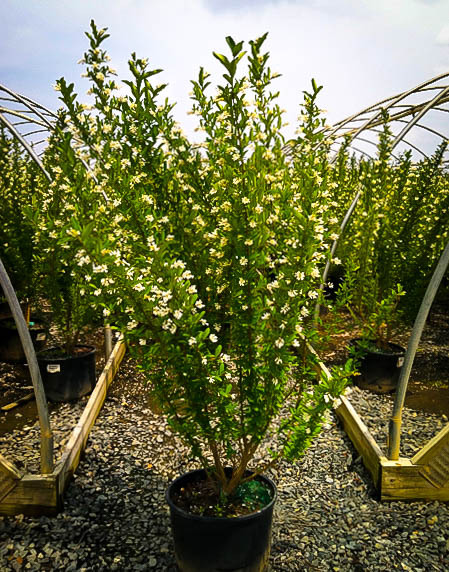 This truly is one of the toughest small trees you can plant, yet with its white flowers and black berries it is also an attractive tree with something interesting to look at all year round. One of the most needed plants in the garden for screening and hedges are fast-growing trees and shrubs. To be truly useful, these plants need to be not only fast-growing, but undemanding for light, soil and water. 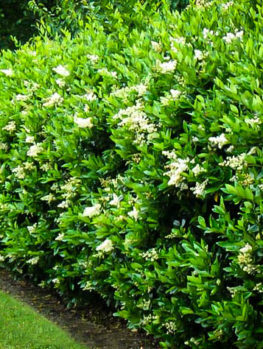 They are also most effective if they are evergreen, and they need to be tolerant of hard pruning, so that they can easily be controlled and effectively used for screening. Some screening trees are too large for medium to small gardens, but the California Privet is the ideal medium-sized screening plant that ticks all the boxes. 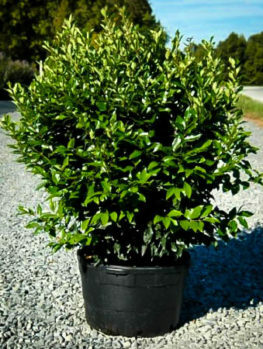 Not only will it grow almost anywhere, including harsh urban conditions and among the roots of established trees, it also has softly-glossy foliage that is always attractive, fragrant white flowers that attract butterflies and black berries that are loved by local birds, so it is a worthwhile addition to any garden. 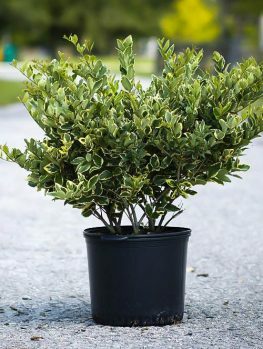 California Privet can be maintained as a medium-sized or tall hedge, allowed to grow as an attractive background plant, or used to fill those places in the garden where most other plants will not grow. After a little care becoming established, this plant is free of pests and diseases, very drought resistant, trimmed with no trouble, and always attractive. If it becomes too tall, just cut it back as much as you need. Thick bare branches will begin to re-sprout almost immediately and your trees will come back thicker and sturdier than ever. No one really knows why this plant, Ligustrum ovalifolium, is called California Privet, because it grows naturally in Japan and South Korea. Perhaps it was introduced to North America by being brought across the Pacific to California, but we really don’t know. Whatever the reason, this is the name it is known by all across the country, and it has an excellent reputation for all those situations where you need a tough, reliable plant. California Privet will grow to 10 or 15 feet tall if left un-pruned, with an upright habit, drooping a little at the ends of the branches, especially when they are full of fruit. It is a fast-growing tree, adding 3 to 5 feet in a season. Although upright, it has a rounded habit, and can be as wide as it is tall. The leaves are around 2 inches long and 1 inch wide, oval in shape, with a smooth, slightly glossy upper surface in a rich green color. 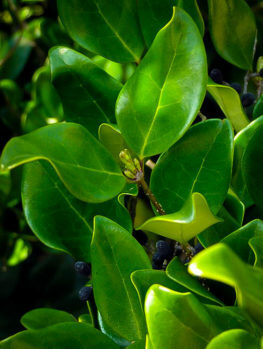 California Privet is evergreen in most areas, but some leaves may drop during cold spells. The bark on the California Privet is smooth, reddish when young and soft grey when older. This plant blooms in summer and the white flowers are carried in bunches about 4 inches long on the ends of the stems. They have a soft, honey fragrance and a tree in flower is very attractive. Butterflies love to visit the flowers and drink the sweet nectar. The flowers are followed by clusters of pea-sized berries, which begin green and become black when they ripen in early winter. These are not edible to us, but birds love them and they can provide valuable winter food, especially in urban areas. 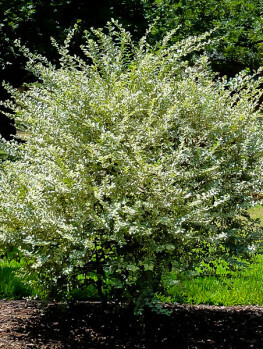 Choose a sunny or shady spot for your California Privet. The great thing about this plant is that it will grow almost anywhere, under the harshest conditions, although it is not tolerant of constantly wet soil. Young plants will benefit from some fertilizer, but really this is a plant you can just put in and leave alone – ideal for the busy gardener. 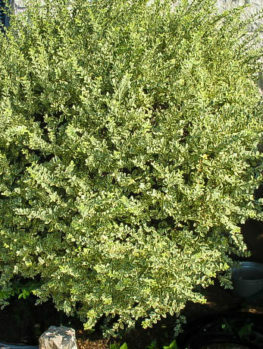 California Privet is free of any significant pests or diseases and very tolerant of drought. 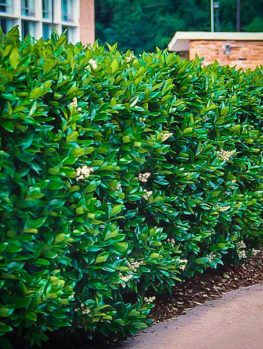 California Privet can be pruned at any season, as much as is needed, but light trimming from an early age will keep it very dense and bushy – ideal for a hedge. 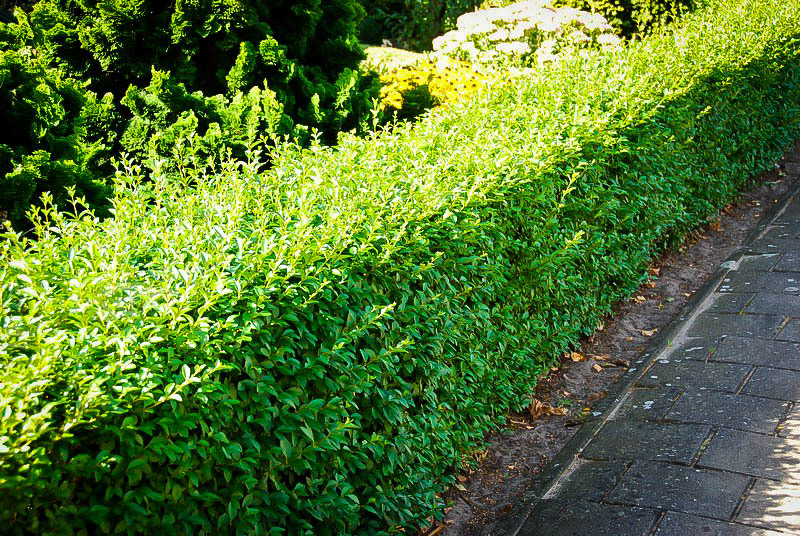 To create a dense hedge up to 10 feet tall, place plants 3 feet apart in a row and keep the upper part narrower than the bottom – in other words, trim with a small inward slope. This will keep the lowest part healthy with plenty of leaves on it. 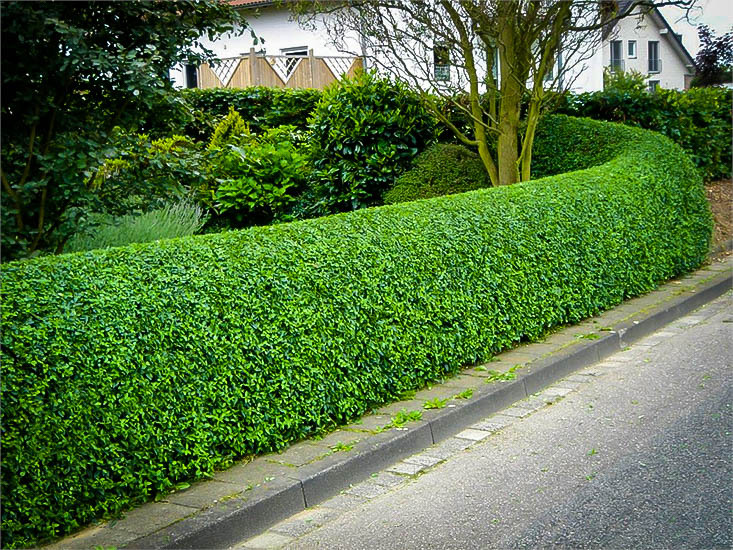 If your hedge gets too wide, just cut it back as hard as needed, right into bare wood. It will soon re-sprout. Of course if you prune regularly fewer flowers will form, but pruning just once a year immediately after flowering will remove the potential seeds, but it will encourage more flowers for the following year.